2 Therapist Massage $400 3 hrs. With 45 min. EFT Session $450 3 hrs. 45 min. If you are ready to experience an emotional shift and move into more joy, than this day is for you. This session will create a safe space for you to let go of that which you are ready to release and create new openings in your life. The day includes an Abhyanga Massage with 2 Therapist, Chakra Balancing, Heart Basti & Shirodhara. If you choose to do the EFT Tapping Session, we will begin by tapping into the emotional block that is keeping you stuck and sapping your energy. Tapping is extremely fast and effective for releasing emotional blocks and creating new possibilities and freedom. If not, your day begins by setting your intention. We start the treatments with an Abhyanga, which is an Ayurvedic oil massage with 2 therapists working simultaneously, using specific oils and aromatherapy to bring you into your body and breath. 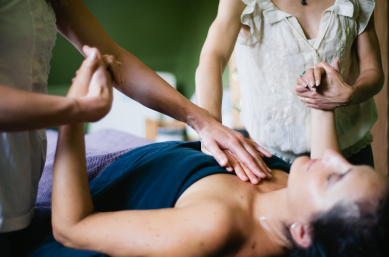 The practitioners will luxuriously massage warm oil into the tissues of the entire body, to help loosen and facilitate the removal of accumulated doshas (vata, pitta, and kapha) and ama (toxins) from the body. Marma Chikitsa is incorporated into your abhyanga. Pressure is applied to the vital healing points affecting the organs and emotions connected to the subtle channels of the body. Then the chakra system in the body is balanced using sound, color and aromatherapy. Next during the Hrid (Heart) Basti A dough ring is placed on the chest over the heart center and filled with warm herbal and essential oils to create a portal for healing the physical and emotional heart. Sound therapy, breath and mindfulness are brought into the session for a deep release and heart healing. 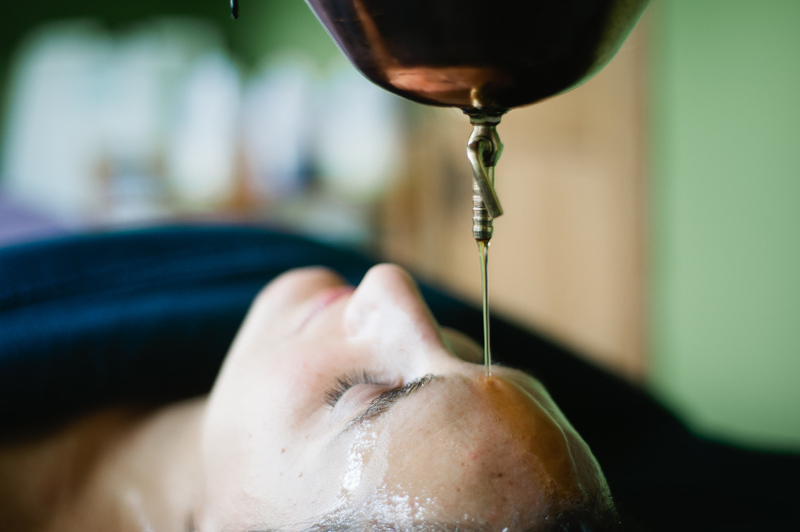 To end your day, you will receive Shirodhara (often thought of as the Queen of all the Ayurvedic treatments), in which a stream of warm oil is continuously poured on the forehead for 30 minutes. This profoundly calms the mind and expands consciousness, thereby relaxing the entire physiology. Shirodhara activates the pituitary gland and can balance the hormonal system. In addition, this treatment has the added effect of awakening the third eye, invigorating the body and mind and stimulating cognitive memories. This is a great way to deeply integrate the healing from the day.